They call it a number of things. Geo-engineering, solar radiation management, persistent contrails, chemtrails, terra-forming, messing up the skies so we can’t see ET spacecraft, etc. 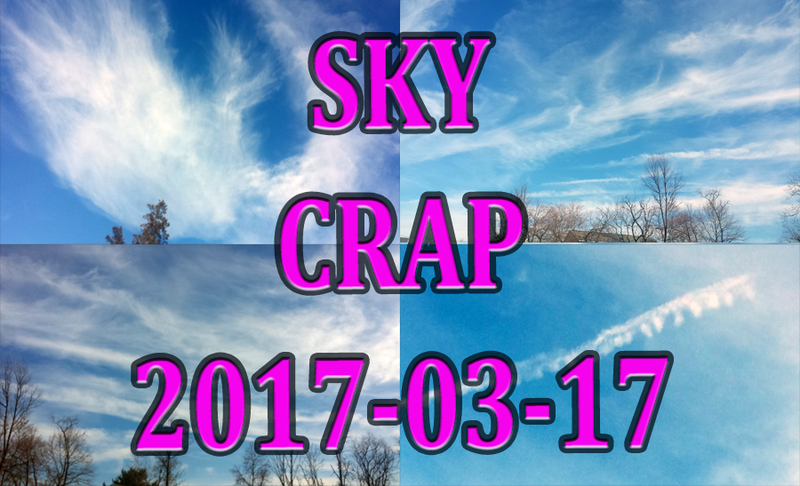 but to me the most appropriate word for it is Sky Crap! Raining down on us each and every single day. Down on any and every thing under the sky, so that means every thing! There are links to respiratory disorders, morgelions, aluminum poison of the earth, trees and of course people………….. And a host of other crap! I am no atmospheric scientist. But I do have eyes and I have been around long enough to know the difference between what the sky looked like when I was a child to what it looks like now. I live near an airport and to say its just atmospheric effects on the exhaust from planes is so disingenuous because that says that the atmospheric effects on the exhaust from planes must change within a few hours. Persistent contrails? Then why do they spread out? Anyways, I used to make a lot of videos, when I first realized what was happening. I felt like Sherlock Holmes or Christopher Columbus. I prided myself in being there at the right time to catch the rascals. I saw all kinds of weirdness. Red/orange clouds, black streak clouds, rainbow clouds, white luminous clouds that lit up the sky but not the ground… all kinds of feathery shaped clouds, etc. After seeing it day after day the novelty wore off. But Hey, I may just remake those videos for posterity’s sake. Toxic Skies. 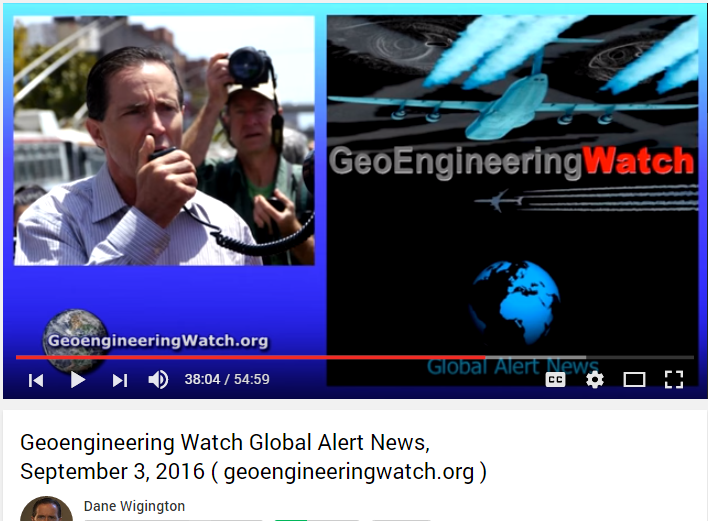 , Geoengineering Chemtrails feature film…A Must See…….. Become a patron @ https://www.patreon.com/nanabaakan. Carnicom Institute is a non-profit organization working solely for the benefit of humanity. NB Commentary: I have been watching the skies all my life, and at nearly 65 years of age, I have seen the sky change drastically over the past 20 years. As a child, I would look at the clouds to try and determine the shapes they would display. It was with deep joy and excitement to watch them shift and change. Now, the shifting and changing of the skies is downright scary because I feel know joy and excitement anymore. It saddens me as I know there is a purposeful hand behind changing our Earth skies to alien skies. It’s a form of terra-forming as we can say has happened on other planets according to reports, however dubious. We can see it happening here on this planet and there is no doubt of it. It is happening worldwide particularly in the NATO allied countries. It is being used for nefarious reasons and being denied for other nefarious reasons but for sure our skies have changed and are no longer pristine and beautifully blue. Does anyone remember the songs we sang about the blue skies and how joyful those songs were? I have made countless videos on the “Skies Above Me” and as time as gone by, I have grown tired of taking videos. For one, initially the skies were visibly changing and I could document the change, now, they are just the same old skycrap, day in and day out. I have lost the desire to explore and discover what is happening overhead because it’s the same ole same ole. Nothing to see here. There has to be some mad man or men at the helm of this debacle, who cares not what happens to his very own. Maybe they can be saved, maybe not, as we all know, family don’t always go along with your program anyways. So, if they don’t I am sure these folks at the helm, the Man/Men behind the curtain have no cause or regret for losing them either. These men are after immortality at any cost and if they are immortal, having to share the planet with mere mortals can definitely give them even greater cause to eliminate them. Human beings on this planet, especially in the industrialized world, have given up on going “back to nature.” Forget it… continue to consume, consume, consume, until it’s all gone. Funny thing, after it is all gone, those who did go back to nature will survive. They may be in the wilderness , while the elite counterparts are hunkered down in their Deep Underground Military Bunkers, but eventually, they will have to come out, and when they do, they will see the real world, the Matrix they created. For some reason, these Psychopaths think their demise can be avoided while they kill off the rest of us. It really makes you wonder what alternate Universe they live in. With each passing day, with each passing week and month, the overturning of our former reality is unfolding. As countless individuals in our society try desperately to cling to the fading paradigm they have known, their propensity toward total denial is reaching ever more astounding levels. 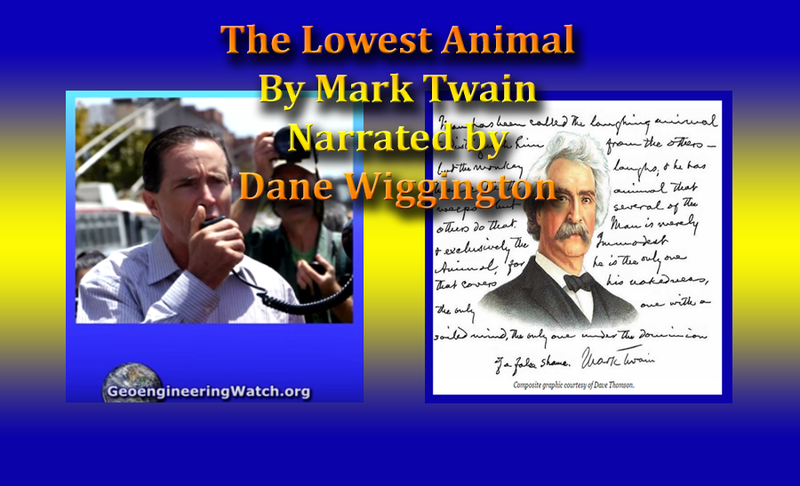 Others, in agencies and the media, are displaying unimaginable levels of tyranny and public betrayal as they grasp for what they falsely perceive as security by conforming to the heard mentality. In addition to the 24/7 climate engineering toxic aerosol assault, citizens in the US and elsewhere are now being sprayed with incredibly toxic organophosphates under the guise of mosquito abatement. The economic implosion continues to move in lockstep with the unfolding biosphere collapse, even Walmart is letting 7000 employees go. The US has become a war state that is simply a tool of the military industrial complex, but is this really anything new? How close is global conflict? How much longer can the biosphere function under the all out assault from countless directions? When will the apathy and denial of first world societies finally shatter? Each of us is responsible for ourselves, for our own conduct, for what we do (or don’t do) toward the greater good. We must stand together with unyielding resolve to help with the most critical effort of all, to wake the sleeping masses. Make your voice heard, make every day count.